Since his election and with each new utterance, many of us have been debating what labels apply to Pope Francis. Perhaps one that we haven’t applied but may be most accurate after some study is the label “Perónist”. 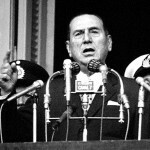 Juan Perón, leader of Argentina from the mid-40’s, drove government initiatives that were to be a “3rd option” to the assumed alternative extremes of capitalism or communism. In the region, capitalism was linked to imperialism, therefore, Peron also drove a strong anti-imperialist agenda. What we view now as something akin to a corporate socialist framework, Perón tried to find a fine balance between limited capitalism and generous worker’s rights, which in reality created conflicts between capitalists, socialists and workers caught in the middle. Over time, Perón descended down the path into heavy-handed authoritarianism in order to drive out dissent, and was eventually driven into exile in the mid-50’s. Within this cultural instability and indoctrination, Jorge Mario Bergoglio spent his formative teen years. He became a Jesuit during the period of Vatican II upheaval, where no doubt he was exposed to heavy doses of Central & South America liberation theology freshly allowed to see the light of day. Surprisingly, Pope Francis is considered “conservative” by the standards of many of his countrymen today. Perhaps he has obtained a wider worldview that has pulled him back from the brink of socialism. But from an “unfettered imperialistic capitalist” point of view, one can see many similar themes (and concerns) between his papal pronouncements and the historical ideology of Perón. This recent article from the Washington Post offers some additional facts in the matter.